The Wikipedia shows the former flag [before 2008] of the City of Astana, the capital of Kazakhstan at http://en.wikipedia.org/wiki/Astana. However, it seems that this is the photo of the actual flag, so I tried to make a reconstruction. The flag of Astana already has a descriptive featured on FOTW, but now I have presented the graphic layout. There is represented the old flag of Astana, as with blue emblem, as a source there is Wikipedia. But the page is a photograph with a different flag (red and gold rays on flag). New COA of Astana adopted July, 5, 2008 by Maslikhat (city council) of Astana. President of Kazakhstan N.Nazarbaev took part in disigning of the COA. The (light) blue and yellow rayed background reminds of the Soviet Air Force flag (and Russian). A connection would not be unimaginable. For additional information go to Astana (official website). 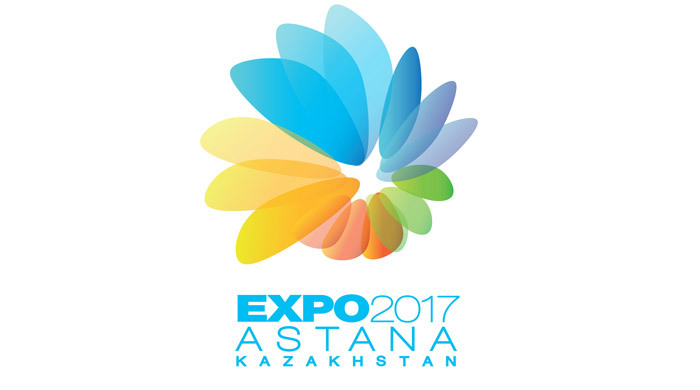 Expo 2017 is an International Exposition scheduled to take place in 2017 in Astana), Kazakhstan. On 1 July 2010, during the 147th session of the General Assembly of member countries of the BIE, held at their headquarters in Paris, Kazakhstan announced its intention to participate in the bidding process to host the International Specialized Exhibition at Astana in 2017 through Rapil Jochibayev, head of project coordination., hence giving cities with counter-bids six months to respond. 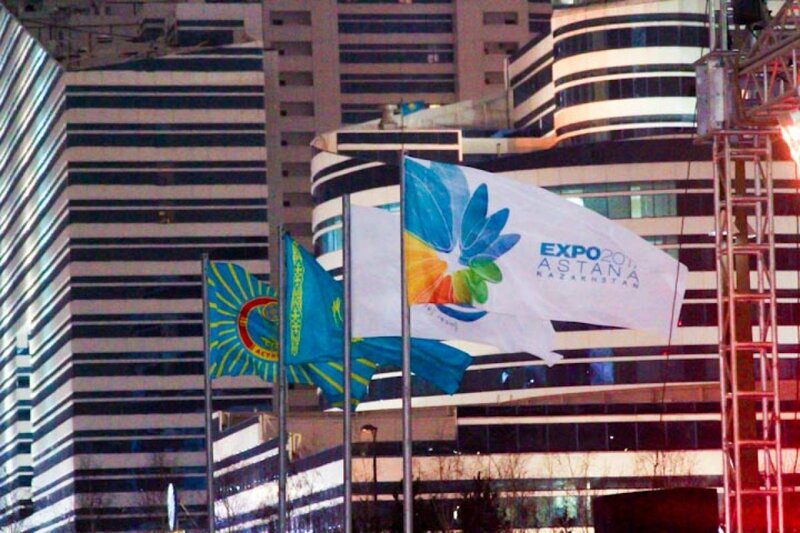 On November 22, 2012, Astana was chosen by the International Exhibitions Bureau (BIE) as the venue to host Expo 2017, which will focus on the theme "Future Energy". It is scheduled to be hosted from June 10 until September 10, 2017. Expo 2017 will be the first time that a major international exhibition of this kind is coming to a country from the former Soviet Union. More than 100 countries and 10 international organizations are expected to participate." The flag of the city of Almaty is FOTW but this is an old version. Meanwhile, there have been two small changes in the flag and the number of flowers in the emblem representing the number of urban districts. The first change followed after 2008, and the other after 2014. 2, June, 2003, during the "Up to the Minute" news program this morning they showed a close-up of the flag flying at the Baikonur cosmodrome in Kazakhstan. The flag looked green, with a crescent moon facing up and slightly to the left. There was writing of some sort around the moon, but what language is was I am not certain. However, at the hoist, in white letters stacked one letter over another to the bottom of the hoist (with space between the edges of the flag) was BAIKONUR (��������). The official emblem of Baikonur was established by the decree of the Head of Administration (Nr.405 dated November 1998) In the center of the vertical axis there is a main image of the lift-off of the spaceship and the human hands. The composition introduced recognizable objects, symbolizing scientific research in the opening of the sacrament of the universe. Rockets into space hands of a man resembling the construction of a launching pad - a symbol of Man - the creator of space technology, science and daring work, fascinating space and protecting our globe from environmental and other crises. Stylized in a tulip fire - a symbol of local nature. Kolorit emblem is based on dark blue, light blue and ocher colors. The flag of Baikonur was introduced on April 27, 2001 by the decree of the Head of Administration Nr.145. Flag of Baikonur is a rectangular cloth with a blue image of two hands, of which the background of the starry sky and the Earth, the spacecraft will start, and the inscription "Baikonur" in gold letters. The width of the flag to its length is 2:3. The rocket closely resembles a Proton heavy booster (see http://en.wikipedia.org/wiki/Proton_%28rocket%29; whose only lanch site is Baikonur). IMHO, on web-page http://www.tarbagatay.freenet.kz/index.php (in Kazakh language) displayed absolutely not a flag, but a logo. We have no base to think, that it is a real flag of Tarbagatay audany (county) in East-Kazakhstan Region of Republic of Kazakhstan. I don't agree with opinion of Mr.Revnitsev for several reasons. 4. Image file name "logo.jpg" doesn't mean this is logo. I've found thousands flags, coat of arms, crests and seals with file name "logo"
I am still on my opinion that this is flag! 3. If we shall manage to find a website, which have inscription in any language "It is a flag of Tarbagatay". Until this time this figure is not a flags for me. It is only a simple picture. The City of Ust'-Kamenogorsk/Oskemen changed its flag and coat of arms. The design remains the same, but the coat of arms (which is on the flag, too), now is bilingual. You can see the image of the new flag on city's official website http://www.oskemen.kz/kz/city1.htm. Flag of Aktobe, city in Kazakhstan's Aktobe province. Flag is white with city's emblem in the middle.